Our Snub Delete Washer Kits, and all other ATP products are designed to meet the demands required by off-road enthusiasts in every situation. The ATP Snub Delete Washer Kits are manufactured in the USA with functionality in mind while adding some style to the hood or even tailgate of your Jeep. Washer Kit to replace them. The Snubber Delete Kit is sold in pairs and come complete with installation instructions and stainless hardware. The Snub Delete Kits available in Black or Silver/Clear Anodize. These Use existing hood holes, no drilling or permanent vehicle modifications required. 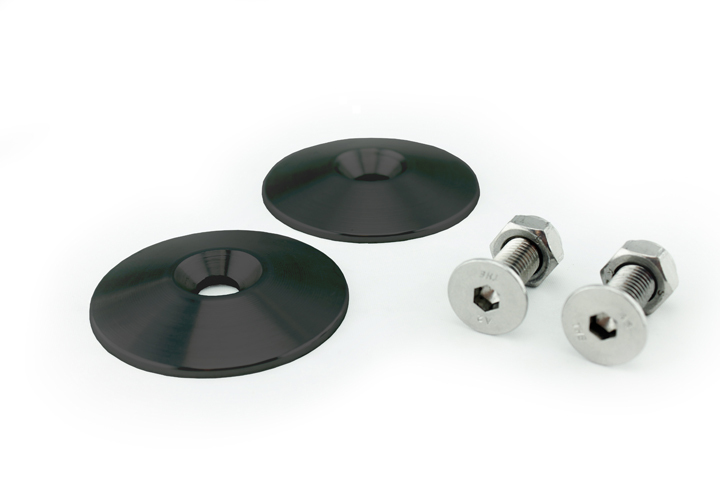 Installation of The Snub Delete Washer Kit can be achieved in minutes and only required removal of factory Snubbers and installing the washers in its place, and securing with the supplied stainless hardware.